I did this walk on Sunday 28th November 2010. 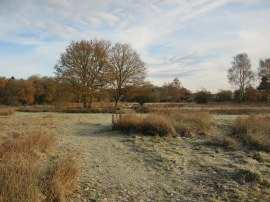 It was a very cold frosty morning and the car thermometer was showing -2C when I arrived at Patmore Heath for the start of the walk; a place I had last been to almost four years ago when I had also parked by the heath while walking along the Hertfordshire Way. From my parking spot I headed across the heath, photo 1, past some enclosure of sheep who all came running over towards me as I went by. Heading to the far corner of the heath I headed to the left down a road that runs round the edge of a patch of woodland. Where the road bends sharply to the left I continued ahead along a footpath that was signed Manuden 3 miles. 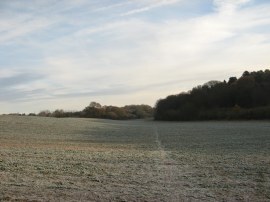 This footpath heads across a field, photo 2, towards a narrower section of field between two areas of woodland. 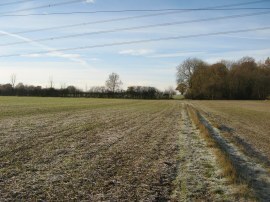 The footpath heads diagonally across this field to the far side before running alongside the edge of the field with trees to the left. As I was heading alongside the field a fox ran across the field in front of me, heading along a clearly defined path between the two areas of trees. Nearing the end of the field the path crosses back over to the other side of the small field where the path crosses a wooden footbridge over a dry stream and heads up a few steps before bearing to the right along the edge of the woodland with a field to the left. 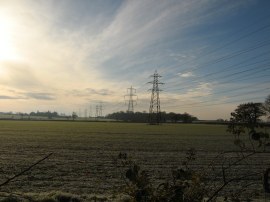 A short distance further on the path turns to the left and heads away from the trees of Patmore Hall Wood along a field edge path that heads towards two lines of electricity pylons, photo 3. Reaching the first of these pylons the footpath heads to the left for a short distance before heading right through the hedge and under the second set of pylons which stretched out to either side across the frozen fields, photo 4. The route then continues ahead along the field edge path to reach a house where the path bends to the left round the edge of the garden to join a road, Upp End. The route heads along the road for a short distance till it reaches the first house on the left. Here I joined a footpath that ran round the edge of the house, where there was a very barky dog disturbing the peace, to join another field edge path. This is followed for a short distance along the field edge before I joined a footpath on the right that headed across the middle of a field towards Mallows Green Road. Crossing the road the path then continues ahead along a field edge up to where the hedge bends to the left. On the map the route of the footpath is then marked as going straight across the field however the actual path on the ground follows the hedge as it bends left, then right. 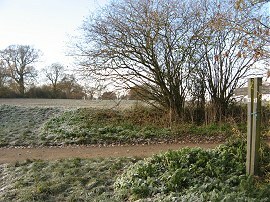 Where this stretch of hedge ends the path then heads diagonally across to the small clump of trees that can be seen in the distance in photo 5 to re-join the marked route as per the map. 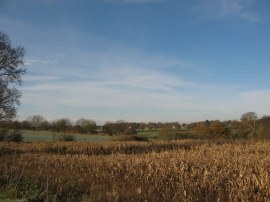 There have been a number of occasions just recently in this area where there have been similar subtle changes to the course of the path which in this case makes a lot of sense as it avoids a large stretch of walking over a field with minimal extra distance; and of course assumes the path had been correctly marked on the map in the first place. Leaving the trees the path heads across another short section of field before joining a hedge line that runs along the back of a large garden. The path bends to the right then heads to the left alongside the edge of the field to reach Dogden Lane at the point where I had finished the previous stage of my walk along the Harcamlow Way a few days earlier, photo 6, having walked 3.3 miles from Patmore Heath. Turning around I had to retrace my steps for a short distance back along the field to the house before turning to the left besides the garden along a short stretch of path that leads back to Mallows Green Road. Heading across the road I joined a path that heads diagonally to the right heading towards a gap in the hedge. Heading through this I then headed diagonally across a small field with black painted barn on the right and a small pond hidden away in trees to the left before heading to the right along a field edge. The path crosses over from one side of the hedge to the other where it joined a track where the frost had made the very muddy path besides the field nice and firm to walk on, photo 7. As I was walking alongside the field I stopped for a quick chat with another walk who was doing a circular walk from Albury who was kitted out in a similar way to myself and also had the same GPS; it always amazes me how few other walkers I see when I'm out and about on these paths. Reaching the end of the long field the route heads to the left and crosses a small wooden footbridge before heading along side a field to reach a road at Chaters End. 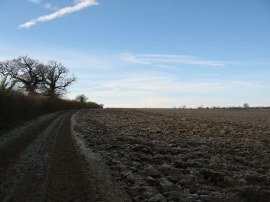 Here the route turns to the right, following the road until it finishes, joining a short section of un-surfaced track that leads back out to fields. The route then passes under two sets of electricity pylons (the same ones I had passed under on my way to Manuden), to join a path that runs round the edge of a patch of woodland, Shaw Wood, photo 8. Reaching these trees the Harcamlow Way crosses out of Essex and into Hertfordshire. The path then heads left along the edge of another long field. It was a fairly still day and the countryside was quiet and peaceful, the sound of the bird song only occasionally being disturbed by the planes from nearby Stansted Airport. Reaching the end of the third field, photo 9, the route heads to the right where the route links up with the route of the Hertfordshire Way. Leaving the track beside the fields the path crosses a small road and heads downhill along a broad track between low fences before climbing uphill towards the houses around the edge of Patmore Heath, photo 10, a 9ha SSSI. Turning to the left along the road the route heads alongside the Heath before turning to the left where the road bends to the right. For some reason the Harcamlow Way does a dog leg here, ignoring a direct footpath down to the Albury Road on the right. Instead it continues ahead then turns down a second footpath on the right that leads down to the road. Here the route then has to head back along the road to the right, almost to the point where the first footpath reached the road; a strange bit of routing for which I could see no point. Crossing the road the Harcamlow Way heads past a farmyard and downhill along a hedge lined farm track to reach the river Ash which, like many of the rivers I have crossed recently, had no water flowing along it. As I was heading down towards the river there were good views over the valley towards the woodland I would soon be walking alongside, photo 11. Crossing the river the footpath continues ahead for a short distance before heading to the right along the bottom of a field to reach Filbert Copse. Here the route turns to the left heading gently uphill alongside the copse and nearing the end of the trees I spotted a fallen log just inside the trees that made a perfect bench for a short snack stop. 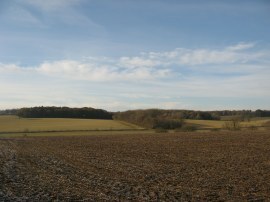 Continuing on, the route then heads through a small patch of trees by a junction of paths before continuing ahead along a rutted field edge track with a patch of woodland to the left which is named as "Ypres" on the map. This path soon joins the road that runs towards Albury Hall where the Harcamlow Way runs along the road with fields to the left and another patch of woodland on the right which is known as "Suez", photo 12. As I neared the buildings of Albury Hall I went rather of course. I missed the fact the road had bent round to the right and I continued ahead on a footpath that heads across a field to cross a footbridge and then on over to the corner of another field. It was having crossed this section of field that I realised my error and then had to retrace my steps back to the correct path. This was a very, very unusually poor piece of navigation on my part and the diversion added almost half a mile to my route. 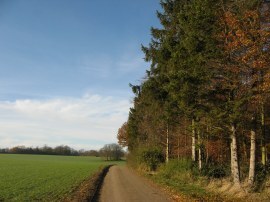 Back on course, the route follows a bridleway running along the edge of a field before passing through a narrow band of trees into the next field. 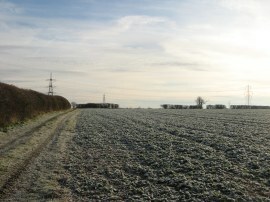 Reaching the end of this field the route then bears to the right across the middle of another field, photo 13, where the sun had by now been warm enough to melt the frozen surface of the path making the ground rather slippery to walk over. 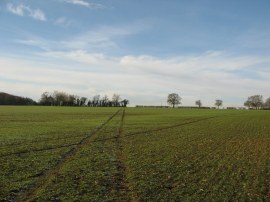 At the end of the field the route heads to the left along a surfaced road, photo 14, towards an isolated house and nearby radio mast. 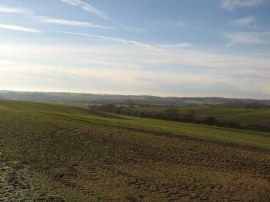 The route had been heading gently uphill and reaching the road there were far reaching views over the Hertfordshire countryside with the pronounced valley of the River Rib ahead. On the map this part of the route is shown as a track and I was surprised to be walking along such a good tarmac surface that winds its way between fields to Friars Road. 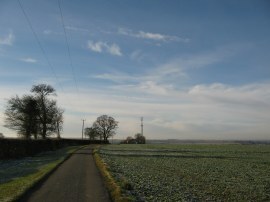 At the road, the Harcamlow Way heads to the left, following the road round as it bends to the right before continuing ahead along a bridleway where the road bends back round to the left. 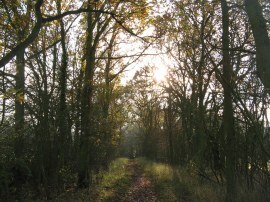 This bridleway heads gently downhill along a tree lined track, photo 15, before heading through a five bar gate into what looked like an area of old parkland. The route follows a clear track over the grass, passing close by the large red brick buildings of Upp Hall, following a metal fence to reach Stortford Lane. 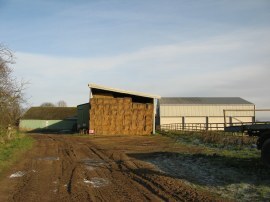 Here the Harcamlow Way heads left for a few steps before joining a footpath on the right which runs between the farm buildings of The Warren, photo 16. 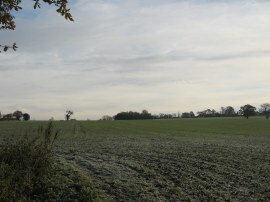 The route then continues along the farm track in the direction of Standon, running alongside the edge of Darney Wood with a field to the right. A short distance down this track, where a footpath joins from the right, was where I finished this stage of my walk along the Harcamlow Way, a mile or so outside the village of Standon. At this point I had walked a further 7.2 miles along the route. 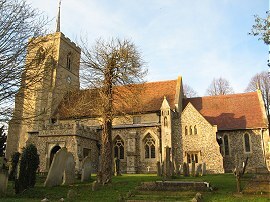 If the day had been longer I would have continued on to Standon and done a circular walk from there but this would have meant I would have been arriving back at the car at dusk and thus, turning around, I retraced my steps back to Friars Road. On the way I stopped for another break on an oak tree near in the field near Upp Hall while a stunt plane was performing aerobatics overhead; entertaining but rather noisy. Back at the road I then headed to the right down the quiet lane. There was a footpath running roughly parallel with the road but the decision to walk back along the road meant I avoided heading across the middle of a couple of ploughed fields and not a single car passed me as I headed towards a water tower I could see on the horizon, photo 18. Towards the end of the tarmac the route heads by a number of houses in the hamlet of Braughing Friars. Just before the water tower is reached, the route passes an area of woodland on the right where I could see a large number of pre-fabricated huts which once housed a poultry farm that were now steadily being overgrown by the greenery around the trees. 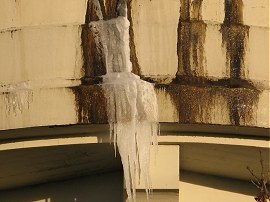 Reaching the water tower I could see that it was leaking slightly which had led to a some long icicles, photo 19, hanging off the structure, which gave some indication how cold the air temperature still was. 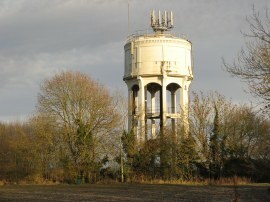 My route followed a field edge path round the water tower that heads towards Albury. Leaving the fields the route joins Parsonage Lane on the outskirts of Albury before continuing ahead at a road junction towards the centre of the village. Just past the church, photo 20, I headed up a few wooden steps and through a metal kissing gate to join a path that heads downhill across a field towards bridge over the river Ash I had crossed earlier in the day. 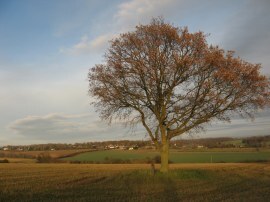 Close to the entrance of the field was an oak tree, photo 21, and underneath a small plaque stated that it had been "planted by the people of Albury to commemorate the coronation of King George VI, 12 May 1937". From the bridge I retraced my earlier steps back up to Albury Road before heading the short distance to the left to join the footpath that leads directly to Patmore Heath from where it was just a short walk back to my parking spot. Reaching the car I had walked 14.4 miles. The temperature was still around freezing point however the bright sunshine and lack of wind meant that it did not feel that cold. In fact I had been quite lucky with the weather as all day there had been a lot of cloud away to the east which never came any closer to where I was and on the drive home I saw a number of cars that were covered in snow which had probably come from that direction. I now have just two more stages left before I will have completed the walk having finally made some good progress along the path over the last month. 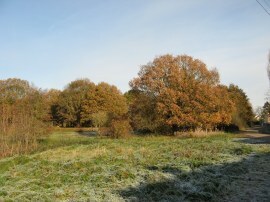 I have uploaded the route of the walk which can be accessed here Harcamlow Way 15 Route.